Start with 5.0 gallons (19 L) of distilled water. (For 5.0-gallon (19-L) all-grain batches, you will need to make more than 5.0 gallons (19 L) of brewing liquor. Scale the recipe up appropriately. For extract batches, you may only need to make half of this volume if you use distilled water for the dilution water.) Then, just follow the steps to make your water. Be sure to taste it before brewing. You could also use tap water with a very low mineral content (total dissolved solids under 25 ppm) as a starting point. However, if you do so, you will need to eliminate the chloramines in the water first. Either filter through a large carbon filter or add one Campden tablet per 20 gallons (76 L). 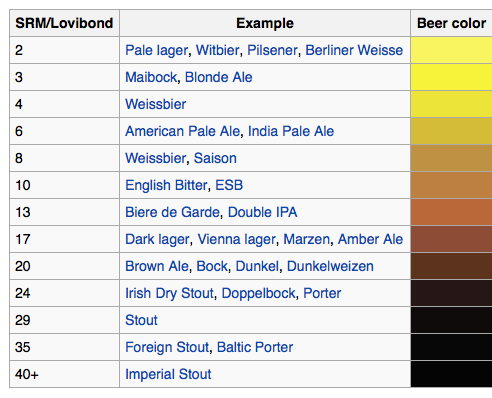 Calculate the color of your beer, based on the grain bill, in SRM. If your recipe contains darkly roasted grains (>200 °L), recalculate this number following the instructions in this article. Choose the level of calcium you wish to start with. For most beers, anything in the 50–200 ppm range is fine. Also choose whether your beer is going to be balanced or if you’d like the hop bitterness to be accentuated. Anything over 1.75 tsp. gypsum per 5.0 gallons (19 L) will yield brewing liquor with at least 200 ppm sulfate; this is considered best for very hoppy beers. Add the specified amount of minerals to your 5.0 gallons (19 L) of brewing liquor. Any addition of baking soda over 1.6 tsp. per 5.0 gallons (19 L) will lead to sodium levels being over 100 ppm. This may not be healthy for people who are on a sodium restricted diet. Any addition of baking soda over 2.4 tsp. per 5.0 gallons (19 L) will lead to sodium levels being over 150 ppm and likely add a salty taste. This is definitely not recommended. Brewing liquor may contain up to 40 ppm magnesium sulfate (MgSO4). You can add magnesium or not, it’s your choice. Some brewers feel that around 30 ppm benefits dark beers. Magnesium has a small effect on mash pH, but not so great that adding the amounts here would throw your mash chemistry off. Making your water as described above should enable your mash to fall in the proper pH range — 5.2–5.6. Optimally, your pH should drop to 5.0–5.2 near the end of the boil. Sometimes, a little calcium is needed to accomplish this. When you boil, look at to your hot break. Once formed, it should be big and fluffy. If not, add about 50 ppm calcium to the boil. For 5.0 gallons (19 L), this is a teaspoon of either calcium chloride or gypsum. If this doesn’t help, try adding another 50 ppm calcium. Using this simple guide should allow you to get your water chemistry into the right ballpark for a proper mash pH to establish itself. Later, you should be set up to hit the proper post-boil pH, too. (A bit of added calcium may be required to bring this about). Matching your brewing liquor to the grain bill of your beer should result in better beer. Take good notes and, if possible, compare batches using untreated and treated water to see if adjusting your water chemistry is improving your beer. And no, I would nt use less baking soda. I’d keep the same concentration of minerals regardless of mash thickness. Stupid question but you mention distilled water, and I use RO water. These are not exactly the same but I assume it doesn’t change the salt additions??? Thanks for a great chart and explanation. RO water should work as well as distilled. Both should have close to zero dissolved solids to start with. I absolutely love this — after a year of messing around with brew’n water with some frustration I finally found this which will be my new method! This is the easy water solution that I was looking for all along. I’ve already shared with several brewing friends, thanks!!! Thanks for this guide. This is very informative and very easy to understand. It’s simple. I appreciate blogs like this.